I've never fired from a real gun before... The airguns were no fun. I had felt a police pistol earlier, but no firing so far. Few days ago at River Kwai festival in Thailand, I saw the booth where one could fire for real. Using the real guns and pistols. For 10 baht a bullet, one could fire them at a target and get a score card. I learnt later that these are 0.22 bullets. The language being a barrier, I couldn't converse with the staff in detail about the guns and related topics. I fired 5 shots from the gun, a bolt rifle, not a single one managed to hit the target 100 yards away. Only later, after my excitement died down, the principles of physics dawned upon me. One should not aim straight and has to compensate for drop in projectile etc. 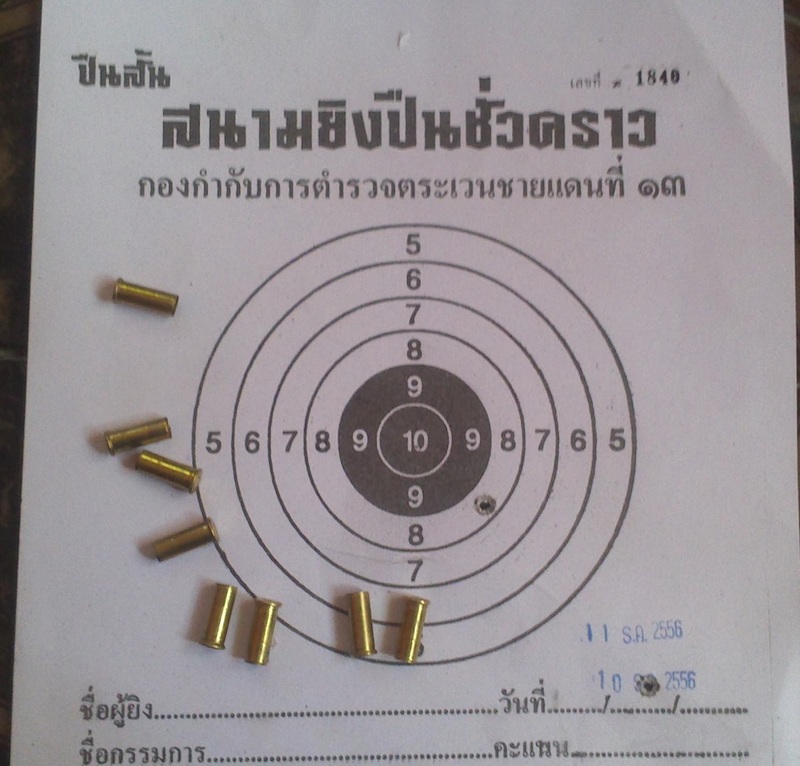 I also learnt how to take out the empty shell of a bullet and how to insert new one. I enjoyed this part. I kept the empty shells as souvenirs. I suspected if airport security would object to it. They took my water bottle away, but didn't mind the spent bullet shells. My shooting accuracy stands at very poor level, but this being my first time, am sure I will improve over time. Above: A pistol with revolving chamber and 5 of them loaded. As I took position and fired, I could feel the heat and smoke generated as the bullet shot out. I fired at dummy target, but in reality, these can kill people. I was expecting some recoil, but was negligible. A friend of mine in Bengaluru has a license to own a firearm- he got for agricultural reasons-his parents had a gun, mainly used to scare monkeys who attack the garden and he got the licenses as a successor, but not before passing a set of police training and tests. It is very difficult to own a gun officially- one has to convince the official for need to have a gun and then clear so many tests. On the other hand. pay a few lakhs and an illegal firearm could be yours in black market. Firing a real gun....lucky you. People tell me that there is quite a jerk that you get once you fire is it true? And did you need ear muffs? No, I didn't use ear muffs. It was manageable without that.